Porcupine meatballs are an old-fashioned favorite, developed during the depression to stretch the amount of ground meat. They are so-named because once cooked the rice sticks out of the meatball looking a bit like porcupine quills. 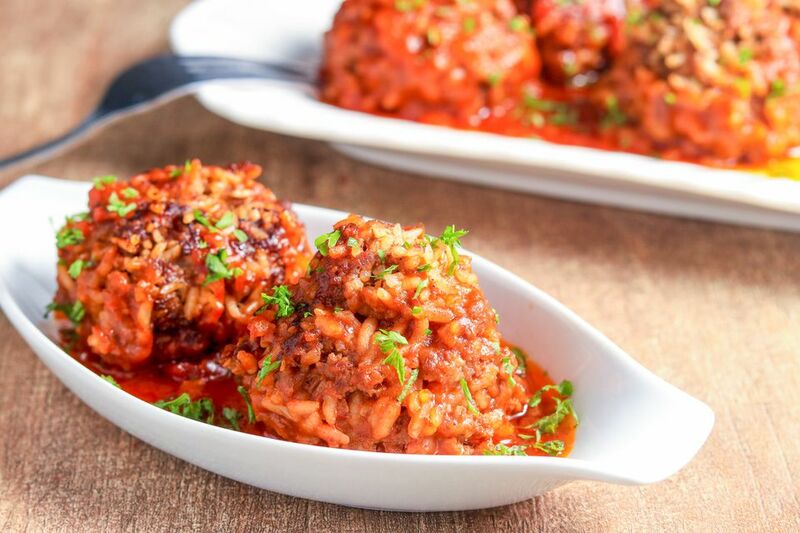 The recipe is simple: Seasoned beef and rice are formed into meatballs, combined with tomato sauce, and baked to perfection in the oven, or simmered over low heat on the stovetop. Although a great thing about these meatballs is that they don't have to be browned on the stovetop first, you do need to make sure to use lean ground beef to avoid excess fat in the sauce (because you won't be cooking it off). If you do use fattier ground meat, you might want to brown them before you combine them with the tomato sauce. Enjoy these flavorful baked porcupine meatballs with mashed potatoes and broccoli salad or your family's favorite steamed vegetables. In a large bowl, combine the ground beef with the rice, the water, chopped onion, seasoned salt, garlic powder, and pepper. Shape the ground beef mixture into 1 1/2-inch balls. Use a tablespoon or small cookie scoop to help make them uniform in size. (Or you can weigh them as you shape them.) Place them in an ungreased 2-quart shallow baking dish. Make the sauce by mixing together the tomato sauce, the water, and Worcestershire sauce in a measuring cup or bowl. Now it's time to cook the meatballs. Continue reading for the oven method, or scroll down to the stovetop method. Pour the sauce over the porcupine meatballs, cover the baking dish tightly with foil, and bake the meatballs in the preheated oven for 55 minutes. Uncover and bake the meatballs 15 to 20 minutes longer, until bubbling and cooked through. Add about 1 tablespoon of vegetable oil to a large deep skillet over medium heat. Add the shaped meatballs and cook, turning, until the meatballs are evenly browned. Drain and discard the drippings. Add the tomato sauce ingredients to the skillet and bring the mixture to a simmer. Lower the heat and cover the pan. Continue cooking for about 45 minutes. Check occasionally and add water, if necessary. If you prefer, you can add an egg to the meatball mixture and use milk instead of water. For a richer and chunkier sauce, replace the tomato sauce and water with a 14 1/2-ounce can of diced tomatoes and a 10 3/4-ounce can of condensed tomato soup. If the mixture becomes too thick, add a little water to thin it.